Reported to function in Windows 7 and in Linux under WINE. Note: FastStone Capture went payware starting from v5.4 so I have made the last freeware version available (v5.3) for direct download as the license agreement does not prohibit redistribution. How to extract: Download the ZIP package and extract to a folder of your choice. Launch FSCapture.exe. Improved quality of 256 color PNG/GIF output. 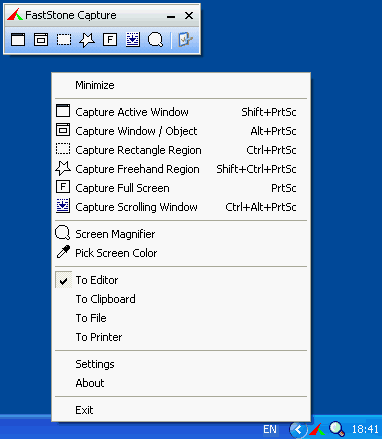 Reset to Primary Screen (only available in Multi-monitor system) to the tray icon's popup menu. @jimdorey: I'm a little confused why we had a listing that this works with Win10 -- it really doesn't. When this version of the program stopped being developed, Win7 wasn't even out yet. Anyway, I recommend trying another software package for that OS. I've updated the entry. @jimdorey: v5.3 works fine on my win 10 x64 using a 1080p screen resolution. Maybe you're using a high DPI screen/4k monitor, and only the last version (8.4, payware, but worth every penny) works fine in that case. Don't care for FSC freeware near inaudible screenshot audio cue ?